For people with busy lives, like students attending culinary academy, a slow cooker can be a lifesaver. This handy appliance makes it simple to get a delicious dinner ready while your attention is elsewhere. Plus, the meals you make with the slow cooker may even inspire dishes you can prepare for your courses. Here are a few ideas you can try any day in the coming weeks. Slow cooking is the ideal way to prepare chicken that drops from the bone. The Kitchn suggested adding lemon and garlic to make this the perfect entree for a night with the family or a dinner party. Rub the poultry with a mixture of minced garlic, olive oil, thyme and salt. Cook the chicken for four to six hours at high heat in a liquid of chicken broth, bouillon cubes, lemon, garlic and soy sauce. Add sprigs of rosemary during the last half hour. When the chicken is done, let it rest for about 20 minutes. Combine the cooking liquid with flour and simmer in a saucepan to top off the dish with a tasty gravy. Pulled pork sandwiches are a barbecue classic, but if you have the time you can prepare them in your kitchen. Trisha Yearwood’s version starts with making a barbecue sauce from pureed onion, tomato juice, vinegar, black pepper, garlic powder, cayenne, hot sauce and sugar. Cut two onions into quarters and place them in the slow cooker. Mix together a rub of paprika, brown sugar, salt and pepper to apply to your pork roast. Set the roast in the cooker, pouring a cup of sauce over the top. Then, cook on low for 10 to 12 hours. When the pork is nice and tender, shred it and place it on buns. 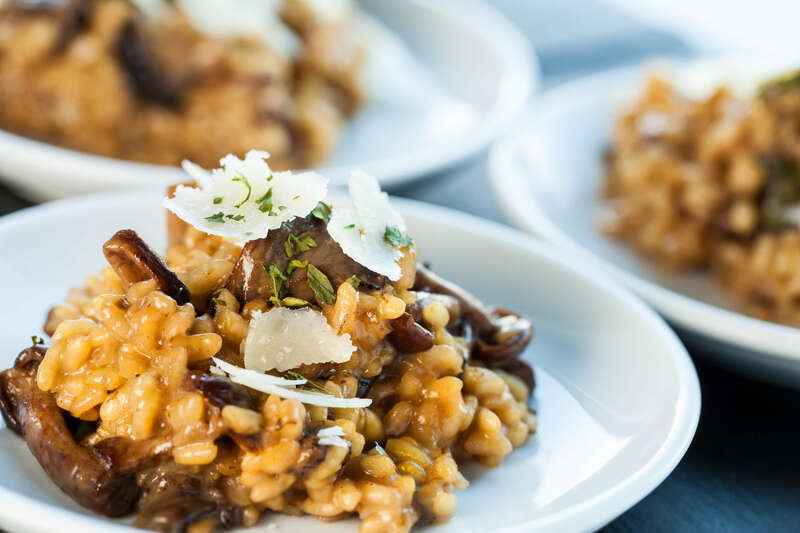 Cooking risotto is a famously grueling process requiring constant attention and stirring. With a slow cooker, however, it becomes a much simpler matter. Foxes Love Lemons offered a recipe made with barley and featuring chickpeas. Saute carrots, garlic, cauliflower and onion in a saucepan over medium-high heat before adding in the thyme and barley and cooking for another two minutes. Move the vegetables and grains into the slow cooker and throw in the chickpeas, chicken or vegetable broth, salt and pepper. Cook on high for about two hours, watching for the barley to grow tender and absorb much of the liquid. Mix in lemon juice and serve with Parmesan cheese. Brisket is another barbecue staple worth trying out in your slow cooker. To add a seasonal touch, Southern Living recommended making tacos with a fruit salsa. The salsa is made with peaches, lime juice, jalapenos, cucumber, garlic, cilantro and kosher salt. To prepare the brisket, first set pieces of uncooked bacon and onion in the cooker. Season the beef brisket with salt and pepper before throwing it in as well. Blend a mixture of chicken broth, adobo sauce, chipotle peppers, garlic, Worcestershire sauce, cumin, dried oregano and honey to pour onto the brisket. Cook on low for about seven hours, waiting for the meat to become tender. Then, remove the brisket and strain the sauce into a saucepan. Cook the sauce over a medium-high heat for about 15 minutes before adding vinegar. Chop the brisket and place it in tortillas, topping with the sauce and salsa. With a slow cooker and quality ingredients, you can make great dishes to enjoy at home or for your an online culinary course. After you explore these recipes, try out your own ideas for extra-tender meat and tasty vegetables.